I’m super excited to give you my first pregnancy update! Since this is the very first one, I’ll give you my brief history and do a recap of the first trimester to get you up to speed. After this, my weekly updates will give you information on what’s been happening for the previous week. I’m so happy to be sharing this journey with you. 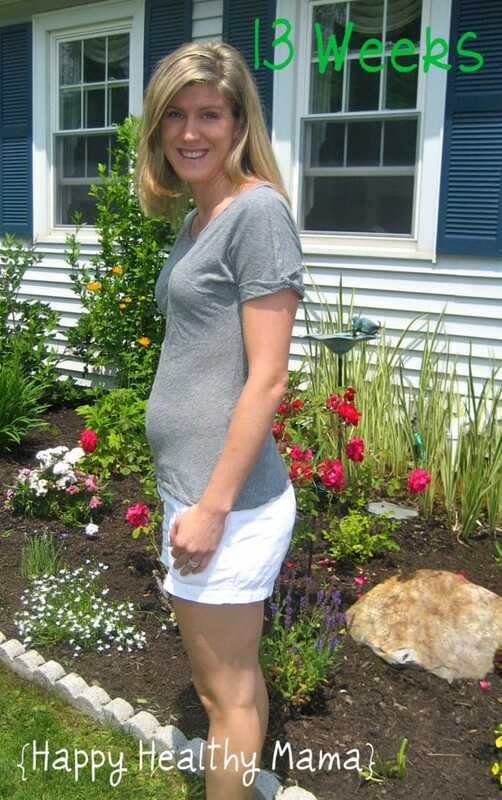 My first pregnancy, with Meghan, was a normal, healthy pregnancy. I was quite sick the first 17 weeks, but nothing out of the ordinary. I delivered her vaginally, a week early, with no complications. When Meghan was about 17 months (last February), we decided to start trying to get pregnant again. With Meghan it took about 8 months, so I figured it wouldn’t happen right away, but it did. If you read my breastfeeding stories (you can find them here, here, and here) you know that I had a miscarriage in May. I was 12 weeks along, but found out at my check-up that the baby had stopped growing at 8 weeks. I was devastated. I knew miscarriage was always a danger, but I wasn’t fully aware that it could happen like that. I thought if you miscarried, you automatically bled and then passed the baby. I didn’t even think about it happening silently. The doctor gave us the option of waiting for the baby to pass naturally or to have a D&C. He warned us there were risks of infections and other complications if the baby didn’t pass soon naturally, so we went with the surgical procedure. It was the most horrible experience of my life. We were advised to allow my body at least 3 months before trying to conceive again, but I needed even more time. Everyone handles this kind of loss differently. Some people want to be pregnant again as soon as possible, but I wasn’t ready. I needed time to mourn the loss and faces the fears I had about getting pregnant again. We were ready to start trying again in November. At this point I was ready to be pregnant and hoped it would happen quickly. Oh, Maryea, don’t try to make plans. Just go with it. Instead it took 4 months and I was pregnant again in March. This time I only knew I was pregnant for a week when I miscarried at 5 weeks. Again, we were advised to wait a few months before trying again. This time, I didn’t want to deal with the hurt, pain, and disappointment. We planned a trip to Jamaica. I signed up for a boot camp fitness class. All things to divert my attention from what happened. In a few months, we’d try again and pray for a different outcome. I had my next period exactly one month after my D&C, so I thought that I probably would start back with regular cycles the next month. When I didn’t start my period, I had a feeling. After a morning boot camp class, I stopped at the store and got a pregnancy test. I went to the bathroom at the store and peed on the stick. Sure enough, the word “pregnant” flashed on the little screen. I was in shock. We weren’t trying, and had actually planned our life for the next month around not being pregnant. Instead, I was pregnant again before even having another period. God works in funny ways, doesn’t He? This is why I waited until the end of my first trimester to tell you about my pregnancy. There were so many times I wished I could just tell you, but I was scared to jinx it. Given my history, I was able to get into the doctor right away. I was nervous about our upcoming trip to Jamaica. The last thing I wanted was to miscarry while I was on vacation. The doctor ordered tests and said the best we could do was look at the hormone levels and an ultrasound and see if the pregnancy looked viable, but he couldn’t predict the future. So we had an ultrasound and the baby, although tiny at just 5 weeks 6 days, looked good. We were able to detect the heartbeat. They tested my hormones and they doubled in 24 hours–a good sign. We ended up going to Jamaica and everything was fine. It was a perfect time to relax and reflect on all that had happened in the past month. I spent a lot of my first trimester scared. Any time I had a good day where I felt less sick than normal, I panicked that something was wrong. Hearing the heartbeat via doppler at 9 weeks eased the anxiety a little, but I was never fully relaxed, and am still not, really. This pregnancy has been different than my first with Meghan, so it’s been hard to gauge what is “normal” or not. Nausea: this has been and on and off thing. Some days I feel it all day, other days it comes and goes. It helps if I never let myself get too hungry. Right when I think it’s going away, it comes back, but I do think it’s tapering off. Vomiting: I’ve vomited about 3-4 times a week. It almost always happens at night, between 9-11 pm, but occasionally during the day. The days that I wasn’t vomiting, I was usually just dry heaving. I’m not sure which is worse. It has been almost a week since the last time I threw up, so maybe this is tapering off, too! Acne: Ugh. I didn’t have this issue with Meghan’s pregnancy. It’s been awful, but I think it is starting to get better. Hormones! Exhaustion: I have been much, much more tired with this pregnancy than I remember being with my first. I nap nearly every single day when Meghan naps. Every day I tell myself that I’m not going to nap; I’m going to tackle my to-do list during nap time. Then I collapse on the bed after putting Meghan down. So far, this doesn’t seem to be getting better. Soon, I hope! Now I’m at 13 weeks and cautiously optimistic. I know that anything can happen at anytime during pregnancy, but feel better that the risk of miscarrying is much lower after 12 weeks. I think I am slowly transitioning into the “honeymoon phase” (aka the second trimester), but I’m not quite there yet. I am in an in-between stage right now. I’m still wearing regular clothes, but can feel my body expanding and know it won’t be long until I need maternity clothes. I pulled out some of my old ones and was amazed at how giant they looked! Soon enough, I’m going to be that big again. I can’t wait, actually, because that means I have a little baby that just keeps growing inside me. Wow Maryea – I didn’t know about your miscarriages! How awful that you had to deal with that! I have a friend who miscarried and she was so distraught and fearful of becoming pregnant again for fear of losing the baby again. But, in her own time, she did and her little boy is healthy and happy. I am so happy that your pregnancy is progressing normally this time around. You look fabulous and I can’t wait for more updates!! Maryea, SO sorry to hear about all that you went through to get pregnant this time around. We had a difficult time, too. Our kids are almost exactly 4 years apart and I actually like the age difference now. Praying for you that things continue normally as they are now. Thanks so much for your prayers, Lisa. I so appreciate it. So sorry to hear of your previous losses. I can’t even begin to imagine what that is like. I wish you well for the remainder of your pregnancy–you look beautiful! Don’t feel bad about napping–DO it! The other stuff can wait. Naps will be very hard to come by once the baby arrives, so enjoy them while you can. Thanks, Candy. I keep telling myself that–enjoy the naps now and don’t feel guilty. It’s hard though when I have so many things not getting done! I just hope to get some energy back soon. You look adorable! I am so happy for you. I can’t wait to see your expanding belly. 🙂 And my advice is to NAP every chance you get. The last nap I took was in my first trimester with AJ. I wish I was kidding but I am not! Once you have two a nap is not usually an option. Thanks, Jillian. 🙂 The thought of not being able to nap for months and months (years?!) is terrifying. I just hope I get my energy back soon! Aww you look so beautiful! I love the little baby bump! I’m so sorry for your losses, I had no idea. I have no idea how awful that must have been. Thank you, Heidi. I’m trying to get over the napping guilt and just enjoy it while I can. It’s hard though! I’m so sorry to hear about your miscarriages. I’m so glad that your pregnancy is going well and looking forward to reading these updates! I am so excited for you! 🙂 God works in mysterious ways but things always work out for the better. We started trying in November and I got pregnant in January and found out in February that it was an ectopic and I had to have surgery. 🙁 Miscarrying is no fun but things always for out. And just think, our babies are having a good time in Heaven waiting for us to join them 🙂 I hope this pregnancy is great for you! Wishing you all the best and sending prayers up for you and baby! Can’t wait to read more updates!!! I haven’t had the chance to congratulate you on the pregnancy! So, congrats! Your baby bump is so beautiful. And I know you must feel that way about it after all those heart-breaking moments. God does work in crazy ways. I’m sorry to hear you had to endure all that pain. Your faith/trust shows and inspires. Thank you for openly sharing about it all and I’m so happy to hear things are going well so far with this pregnancy. Here’s to a healthy next 6ish months! Congratulations! How wonderful to be mostly safe in the 2nd trimester after such a difficult year. I’m truly sorry about what you’ve been through, and glad things look so good right now! I am in my 16th week with my 2nd, and hope this inspires me to write notes about the pregnancy. I never did with my first, and I wish I had! Congrats to you! I didn’t write enough with my first pregnancy, either. I’m glad I have this blog to motivate me this time! what a great baby bump you already have! I am very sorry to hear about your miscarriages, I think this must be the most awful thing that can happen. But who knows why it happend, surely there is a reason we just not might understand. Wow what an epic journey you have been on my friend! Baby, 2 years of nursing, 2 miscarriages, and now…pregnant again! CONGRATS!!!!! I am so, very, very sorry to hear of your losses. I can empathize fully. I am so sorry. Nursing for 2 years? Yep. Been there too 🙂 I loved your 3 part BF story posts. I was nodding in agreement to 99% of it all…including it DOES get so much easier. And i fell so in love with it that i became a lactation educator. Only b/c the beginning was so hard..but finally got sooo much easier. Thank you, Averie. I will always treasure the time I nursed Meghan. I initially chose to breastfeed for the convenience and nutritional benefits, but never could have imagined the amazing bonding time that came with it. I just loved it. oh my gosh, thats a lot of vomitting. But good to hear this one is going well, so far! your bump is just perfect. by the way, are you still sick this time around? So sorry for your losses. You are such a strong woman! Congratulations on your pregnancy! Thank you for sharing your story. Although I can’t imagine the pain you must have gone through, I think it is very important for women to break the silence surrounding miscarriages and to share their pain and experiences. It happens so much more often than people believe, and it’s because of people like you that women (and men) don’t need to feel alone. Thanks. http://www.girlgonechild.net is written by Rebecca Woolf, who is expecting twins in October. She is awesome. http://www.mattlogelin.com is written by Matt Logelin, a single father and widower. He is equally as awesome. He was on Oprah in 2009 and that episode aired again last friday. Thanks Christine–I’ll check these out! Just take one look at the belly shot that Rebecca posted today at 23 weeks and be glad that you only have one baby in there! Also, Matt’s memoir, Two Kisses for Maddy, is a beautiful book. A really good summer read! Thank you for sharing. You look wonderful. Congrats! I love your blog. It is my absolute favorite. You seem like a great mom. Oh, thank you Deanna. That means so much to me. I was so sad reading about your miscarriages! 🙁 And the more happier that you got pregnant again and everything seems fine now! 🙂 A friend of mine is currently expecting her first baby (a little girl), and she didn’t tell during the first months because she was too afraid something could happen. She also was very tired during her pregnancy, and I think you just have to take it how it comes, you never know before. Congrats!!! I am very sorry about your miscarriages, I wish you a healthy and happy pregnancy. Hi – just catching on your blog and I’m so happy to see this post! Congratulations to you guys! I too went through a silent miscarriage and a D&C. It was awful. I’m so sorry you had to go through that. As you are learning, it’s eventually becomes something you don’t think of every day and with every thought. I get a little sad every October, as that is when our little one was to be born, but I find tremendous comfort in knowing we’ll see him/her again some day. With my third pregnancy (with my son), we had a vanishing twin situation which was a whole other set of emotions. So – I totally get being scared every day during the early days of the pregnancy. I’ll keep you in my prayers, that you can lean into God when the doubts and fears come on. I’m sorry to hear about your losses, too, Michelle. It’s amazing how many women have gone through similar experiences. I would never have guessed how common it is. 🙁 I, too, find comfort in knowing we’ll be reunited in heaven one day. Thank you for your prayers! You are in the final countdown! I look forward to being where you are. 🙂 It seems so far away right now. As for the gender…we’ll find out in about 6 weeks. I’m so curious! Found this just based on a search, and felt I had to post as my story is the exact same as yours. My third pregnancy ended in miscarriage at 12 weeks, with the fetus measuring 8 weeks. I was devastated. We were anxious to try again, so after 2 cycles were given the go ahead, and even though I felt my body wasn’t in perfect form, we got pregnant right away. I again miscarried at 5 weeks after only knowing for 4 days. I was so disappointed that I might not be able to complete my family. I accepted that I needed to give my body time to heal and that a pregnancy wasn’t going to happen for a few months, but when my period didn’t come back in the same time frame as the first loss, I took a test. My husband and I just had to laugh at the positive sign. I’ve spent the last few months on pins and needles analysing every ache and pain and am just starting to feel more relaxed at 14.5 weeks. I felt very alone while going through this process as not a lot of people talk about miscarriage. It feels so good to hear that other people have been through what I am going through and I’m not alone. Thank you so much for sharing! Hi Deana! It was a scary feeling going through pregnancy after 2 losses, but I have a healthy 2 1/2 year old now! 🙂 I wish you peace during the rest of your pregnancy!